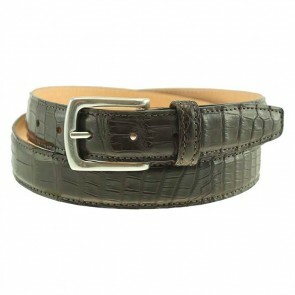 A beautiful leather belt serves as the quintessential “finishing touch” on both formal and casual outfits. At T.B. PHELPS, our leather belt offerings combine comfort, style, and the finest leathers, setting a new standard in men’s fashion. Our unique collection of “American exotics” belts brings a level of refinement to any outfit. Expertly crafted in our own US factory, a T.B. PHELPS belt is an investment in good taste and unsurpassed quality.